I recently passed the American Society for Quality's Quality Engineer examination. In this post and others, I'll share my experience and study tips to help anyone facing this challenge. A Basic Statistics Text with problems to work through and answers provided. I used The Complete Idiot's Guide to Statistics by Robert A. Donnelly. The Certified Quality Engineer Handbook by Connie M. Borror. Copies of the two practice exams provided on the ASQ website. A statistical calculator that meets the guidelines for the exam. Practice with this calculator, and do not bring a graphing calculator to the exam. You will not be allowed to use it. Because I was not currently in a quality position, I took a six week online course called Six Sigma: Total Quality Applications. This served as a good review of basic statistics, problem analysis techniques, control charts, and process capability calculations. If your current job is in the quality field, the course may be unnecessary. Includes a CD with two practice tests. Includes a CD with Acceptance Sampling Tables to determine sample size. Print these out to use during the exam. 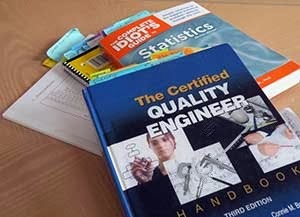 Contains many chapters of information on Quality Engineering to study and use as a reference.